Here you'll find our newly-expanded line of gold tins. 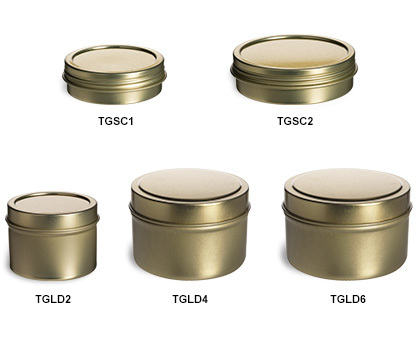 These versatile tins are offered in a range of sizes in both screw-top and slip cover lids. These tins feature a rolled edge design for safety. These US-made tins have a high-quality look and feel, making them a great choice for gifts and favors. All tins in this line are also seamless, which makes them work for poured waxes, balms and other semi-solids. Like all of our tins, these wholesale tins are food grade. Click on the image or ID codes below for further information including bulk discounts and dimensions.